The Shepherd of the Hills Zipline Canopy Tours offer tons of fun to guests of all ages, so if you are looking for something unique to add to your next Branson, MO vacation, give it a go! Known as the highest zipline in Missouri, the Vigilante Extreme Ziprider provides a thrilling experience! Guests will take to the top of Inspiration Tower via interesting glass elevators. 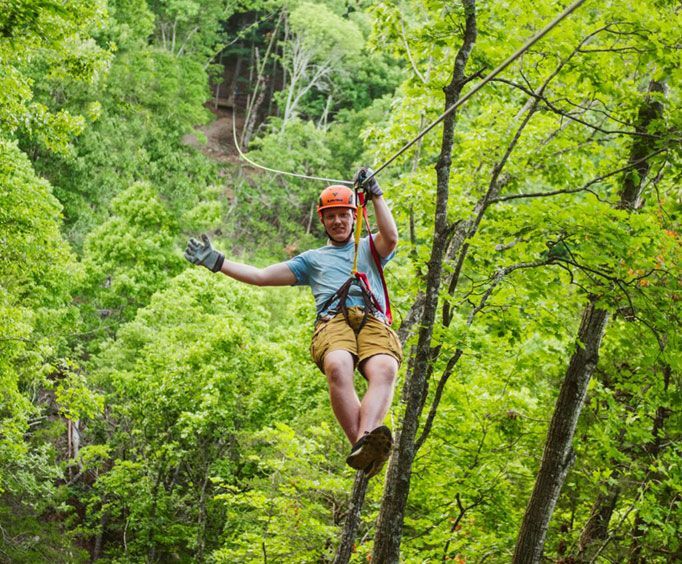 Before riding, look at the beautiful Ozarks scenery below, get in some fun photo ops, and watch the guests before you zooming along at insane speeds! Then, when it's your turn, step right up to the seat where you'll be strapped in and launched from a 170' incline. As you zoom along the gorgeous tree-top canopies, you'll cover approximately one mile of distance and reach speeds of up to 50 MPH. Four riders can go at a time, so the entire family can experience it together. 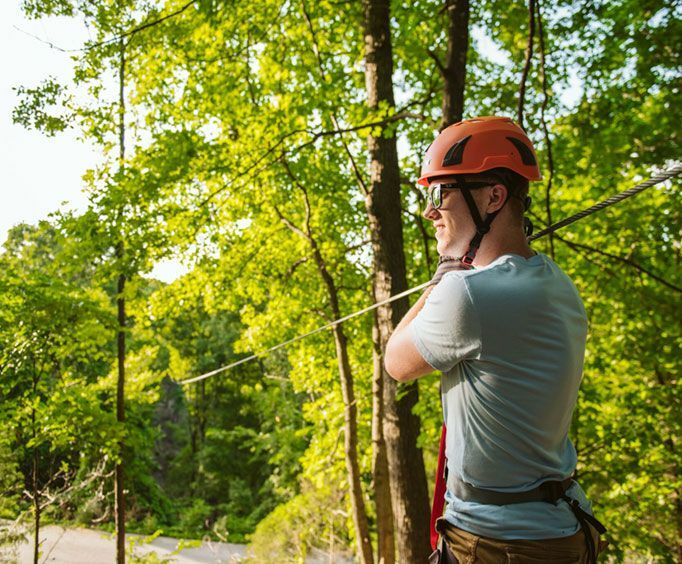 Guests don't need to worry about harness fittings or braking, so it truly puts convenience into your ziplining experience making it great for first-time zip liners. Upon reaching the bottom, guests will be taken back up to Inspiration Tower on a jeep-pulled tram where they can see their ride pics and soak in some more Ozark Mountain beauty. What is included in the admission price for Shepherd of the Hills Zipline Canopy Tours? 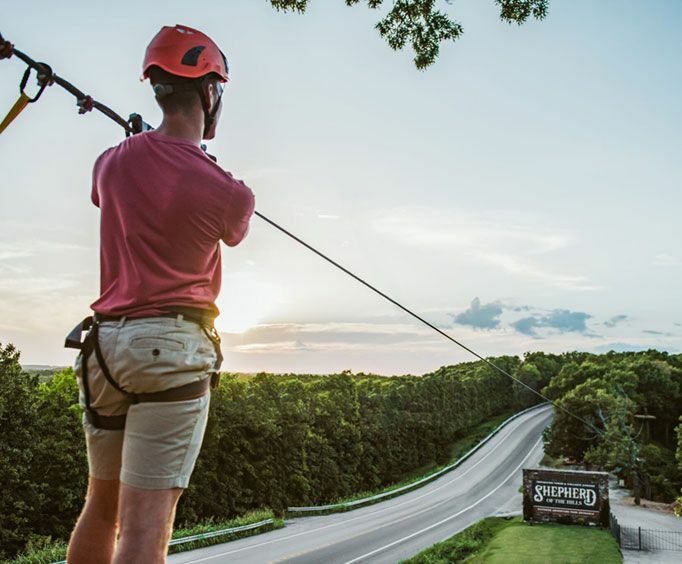 Is parking available for Shepherd of the Hills Zipline Canopy Tours? If so, is it free?